To start my card I first pulled a piece of Tim Holtz Watercolour Cardstock out and used the Sand Dunes and Rocky Shore inks to do a watercolour background using acetate. I then went ahead and used the Film Strip Die from Pretty Pink Posh to die cut it out using white cardstock. I then took the Painted Butterflies stamp set and stamped out three of them using black ink for the outline and then coloured inks for the inside layering pieces. Once everything was stamped and die cut out I adhered everything down to my water coloured panel. 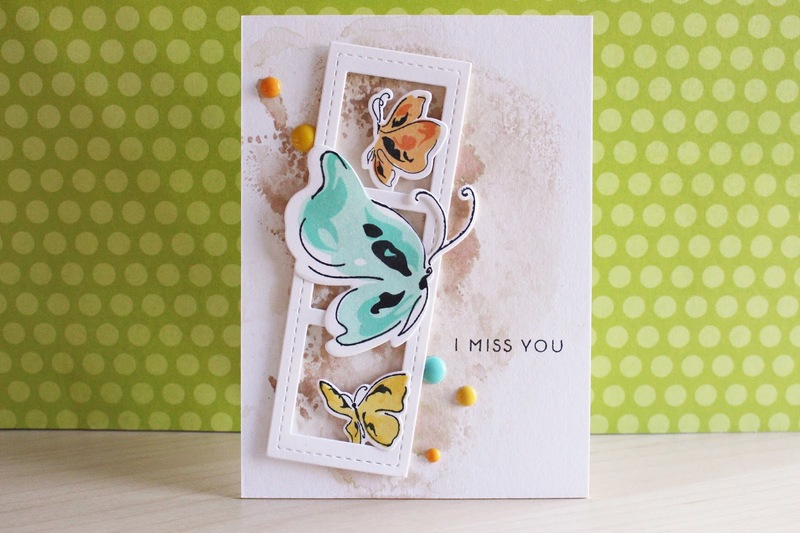 I then stamped the 'I Miss You' sentiment with some black ink onto the background, added a little shimmer using a Wink of Stella pen and added some enamel dots in coordinating colours to accent the butterflies. I hope you enjoyed the card today and the video is linked down below.